From the time of St. Patrick and his introduction of Christianity to the Island of Ireland over 1500 years ago the Island has produced a long line of men and women who’ve lived their lives on earth in Christ like – loving, giving to and unselfishly serving others through God’s Word and the light of the Gospel. Over the same period, particularly from the many isolated monasteries and other such places of learning, it has produced many men and women of scholarly renown – some of which subsequently were instrumental in spreading their wisdom in many parts of Europe. Unfortunately, largely via the sacking, pillaging and destroying of such places by 9th century Norsemen and Viking invaders most of these learned men’s works have been lost. Around 100 years after St. Patrick (Ireland’s patron saint – Feast day March 17) the Island had St Columba (Feast day June 9) – from present day Donegal, who subsequently established his missionary base on the then Celtic Isle of Iona (off the west coast of Scotland). Some other Irish saints of renown include St. Aidan (Feast day: Aug. 31), St. Brendan (Feast day: May 16), St. Brigid (Feast day: Feb. 1), St. Ita (Feast day: Jan. 15), St. Kevin (Feast day: June 3), St. Fiacre (Feast day August 30), St. Edana, St. Fachtna, St. Kieran (Feast day: Sept. 9), St. Killian. St. Fearghal, St. Malachy (Feast day: Nov. 3), St. Eanna, St. Oliver Plunket (Feast day: July 11), St. Finnian, St. Brendan, St. Enda, Saint Columbanus, Matt Talbot and many others. 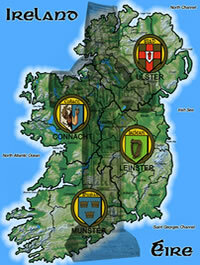 For more information on Irish Saints and Scholars, please contact us.